Today I finally hung my watercolors of Portugal. (The show was delayed twice because of snowstorms.) 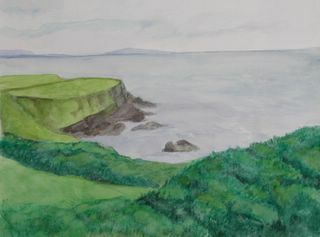 Here is one of the watercolors in the show. 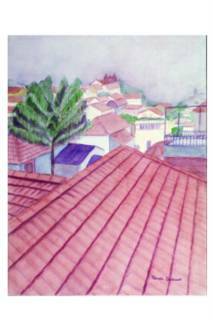 On my first visit to Portugal, I visited Bom Jesus near Braga, and took a picture that inspired this painting. There is an enormous series of staircases at Bom Jesus and they lead to a beautiful garden at the top (inspired by Dante's Divine Comedy, I think.) 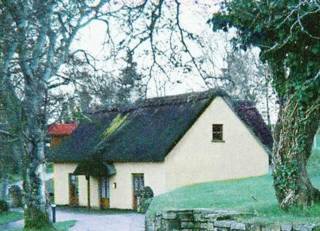 One of the first things you see at the top is this building, currently a visitors center. I loved the columns, the patterns of the windows, and the bougainvillea spilling down from overhead. This is another photograph from my trip to Portugal in November. Today I spent some time editing and organizing pictures from that trip. 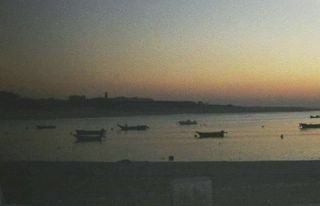 The view of the little boats on the Douro at sunset took me by surprise, so I quickly took this photo from a car as we drove by. 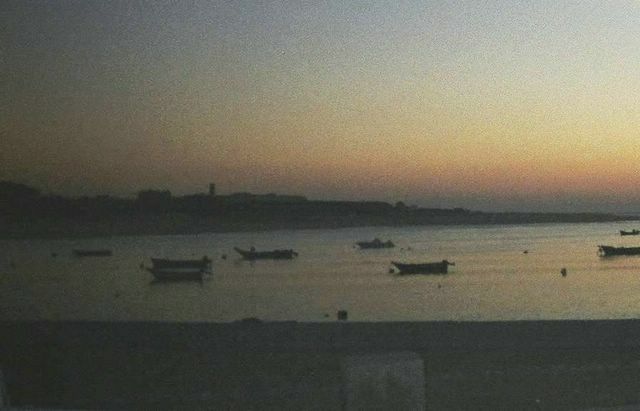 I edited the original photo, cropped and enlarged what I wanted, and then adjusted the brightness till I got the feeling of the boats, the twilight and the setting sun on the water. I just installed Painter IX, early birthday present from Mel, and I tried out the new features on their digital watercolor. You can instantly dry your picture and can even add salt! 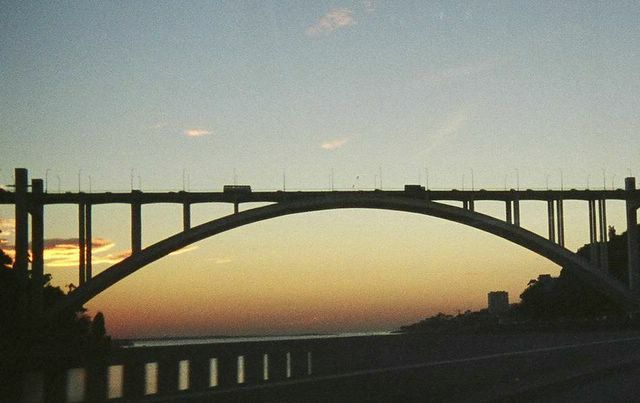 When I was in Portugal in November, I took this picture from a moving car. 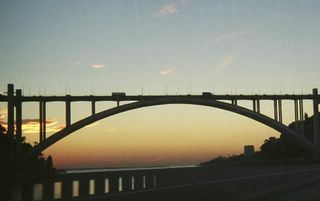 But through the magic of digital editing, I cropped the image to eliminate the dashboard and the traffic, leaving only this amazing bridge at sunset. Mauro says it looks like a postcard. . .
Lots of snow to shovel today, but the sky was bright blue and the snow sparkled like crazy. 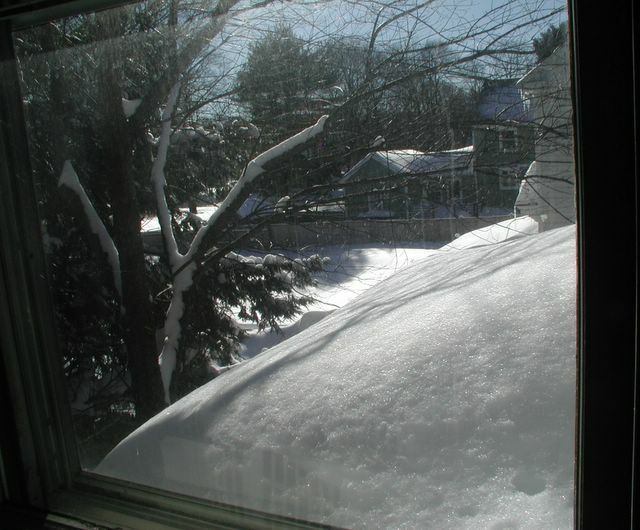 Later, I took this picture of snow on the porch roof, seen through the bedroom window on the second floor. I cropped the photo just a bit, to emphasize the shape of the window juxtaposed with the shape of the image. You can see some reflections in the window, but I like that because it adds to the feeling of looking out at the snow from inside. 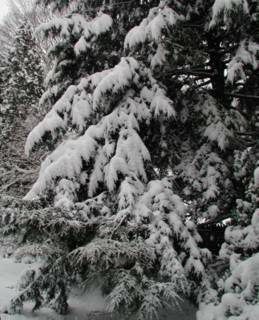 We started the day with thirty plus inches of snow, and it snowed all day, with ten more inches expected when all is said and done. 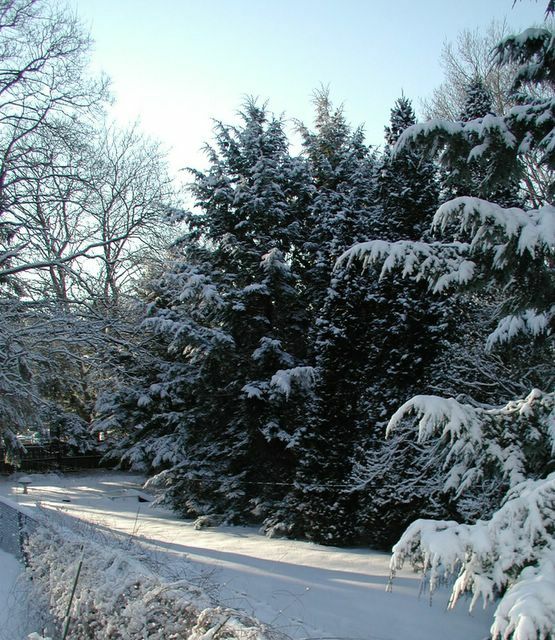 Tomorrow will be soon enough to face the snow. 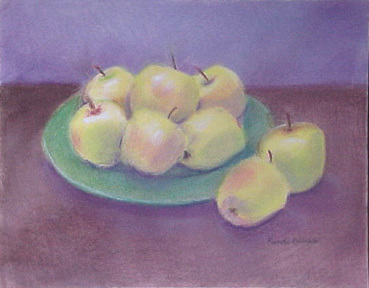 Tonight I am posting this pastel as a reminder of warmer places and warmer times. Since Mel is on his way to London tonight, I am posting this photo which I took when we were in there together last year. 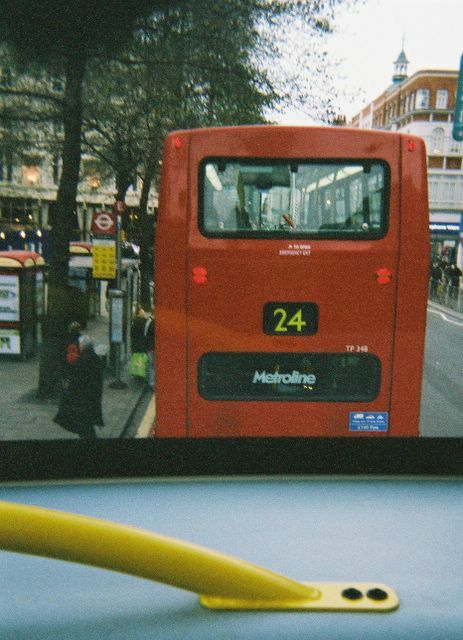 It's a view of a one London double-decker bus seen from another. Tonight I cropped the picture to improve the composition. If you look closely, you can see a bit of yellow from the handle inside the bus reflecting onto the view through the window. I don't mind, since what I was after was the view from the double-decker, the excitement of this new perspective and the hilarity of the ride. I took a picture yesterday as we shoveled out the driveway because I liked the patterns of the fence and the trees in the snow. 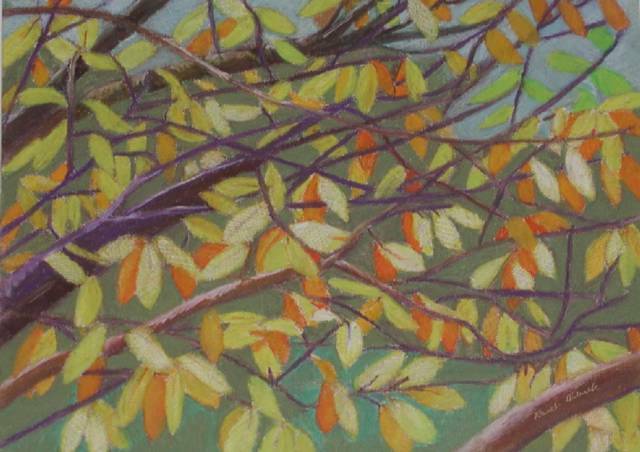 Tonight I cropped the original to improve the composition and focus on the contrasting textures. 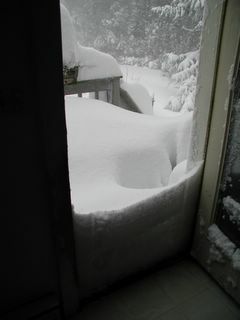 When I went downstairs this morning, I couldn't get out the back door because of the snow. 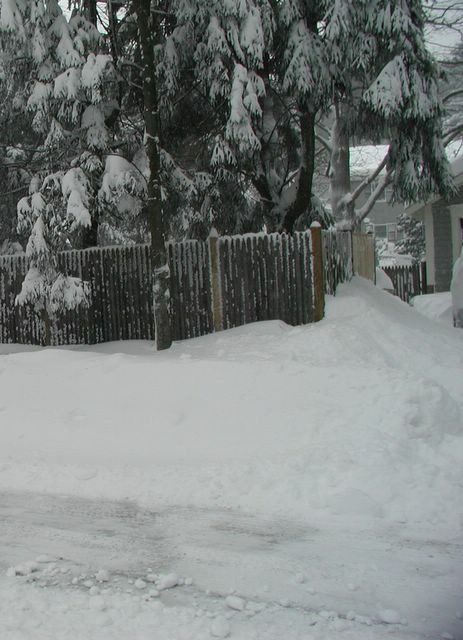 This was my first view of the blizzard. I like the composition untouched, just like the snow, so I am posting it as it is. 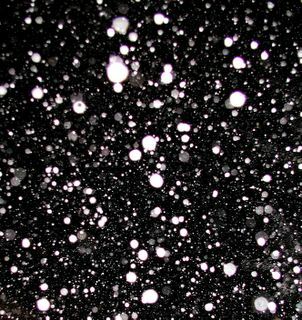 We are expecting a blizzard tonight, but earlier today we had shoreline snow with great big snowflakes. 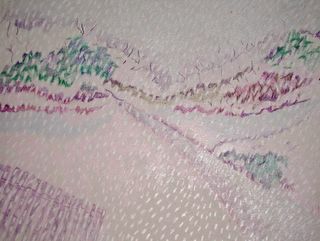 Today I did this drawing with crayons on cardboard, then took a photo of it with my digital camera. As another antidote to the freezing air of Boston, here's a photo of New York City that I took last summer on a very hot day. 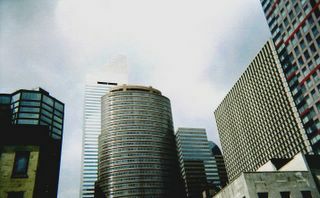 I edited this photo today because in the original version, the Citicorp Building kept disappearing into the sky. Most people think of these buildings as gray, but take a closer look. . . I took this picture this morning as the sun hit the snow in the yard. I had to hurry to because the tree in the foreground is close to the back steps and I wanted to take the photo before anyone brushed against the branches. knocking off the snow. I cropped the photo to emphasize the long diagonal of the sunlight and shadow on the snow. It's cold in Boston but I have been editing pictures that I took last summer. This is a picture of a path in Central Park in New York City. I really love the way the shadows fall on the path. 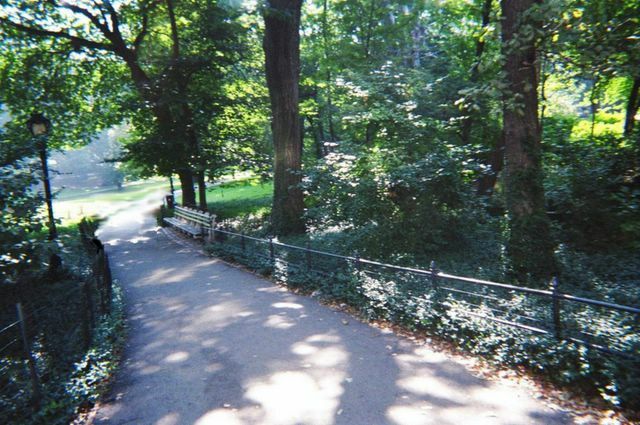 In the original photo, there were two joggers on the path. It wasn't easy to make them disappear. . . 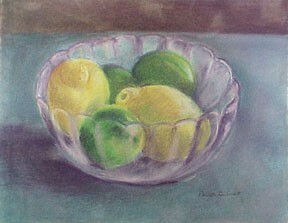 I am posting my pastel of lemons and limes as a reminder that it isn't cold everywhere. Today I talked to people in Florida by video conferencing, and they said it was 70 degrees there. It was ten degrees in Boston. Today I photographed some of my watercolors of Portugal. 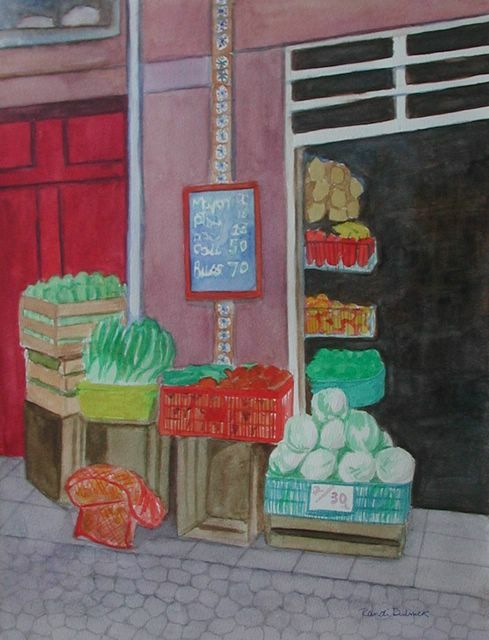 This painting is based on a photo I took in Porto on one of my visits. I love the little grocery stores in the older parts of the town. What a surprise. It is snowing in Boston. . .again. But it is beautiful, soft as a carpet. 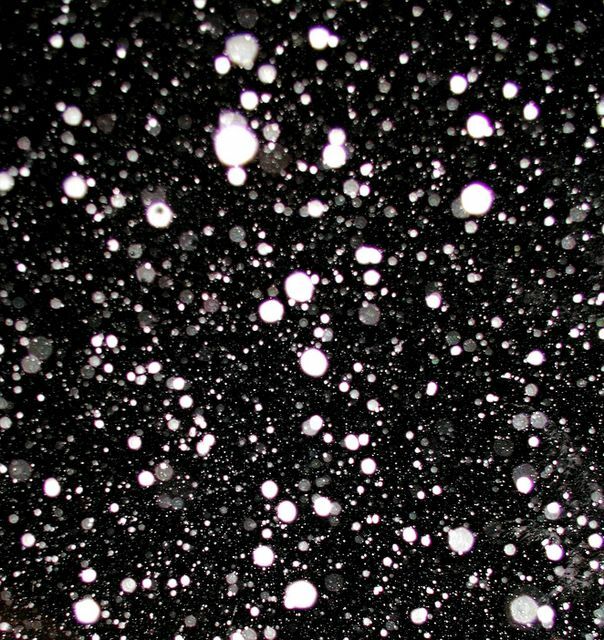 I used my digital camera to take this picture of the snow falling, and cropped it, emphasizing the pattern that looks almost abstract. 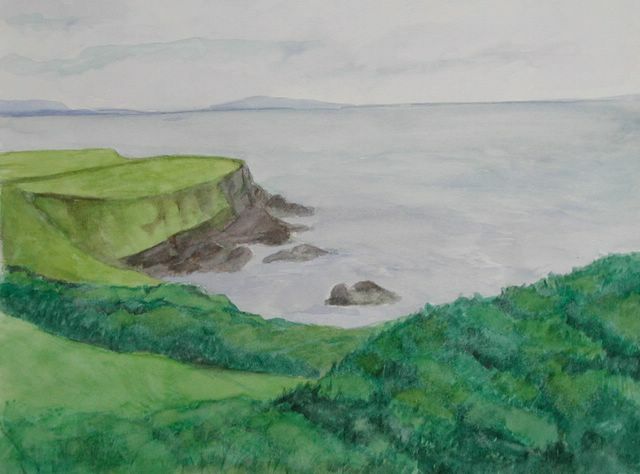 Here is a watercolor I finished recently from a photo I took in Northern Ireland in July, at Giant's Causeway. 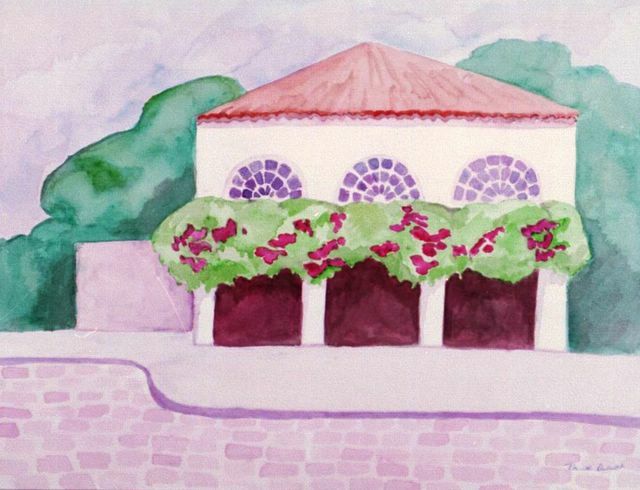 This is another one of my watercolors of Portugal, based on a photo I took during my first trip to Porto. 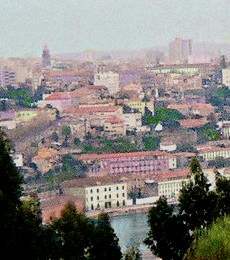 This is a painting of a small town in Northern Portugal where you can see Spain just across the river. A strange photo on a strange day. 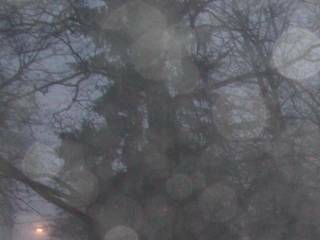 There is still a lot of snow on the ground but it is suddenly warm and extremely foggy. The mist is beautiful. I went out to take a picture as the sun was going down, but in my excitement I forgot what would happen when the flash hit the fog. I liked the accidental effect so much that I cropped the image and here it is. Today I was reading a book about editing photographs, so I decided to edit some photos from my first trip to Northern Ireland last winter. 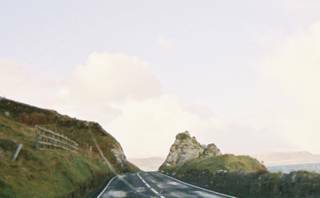 I was completely unprepared for the beauty of the Antrim Coast Road. I took a picture through the windshield of the car. This is the edited version that I worked on tonight. I cropped the image but left one reflection, which somehow seems to work with the composition. I painted this watercolor several years ago from a photograph I took on my first trip to Porto. 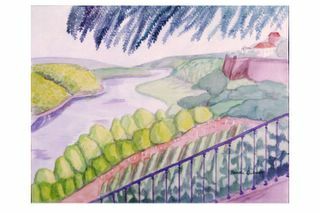 On Friday I will hang it as part of a show of my Portugal watercolors. About this time last year, I was heading home from my trip to Porto. 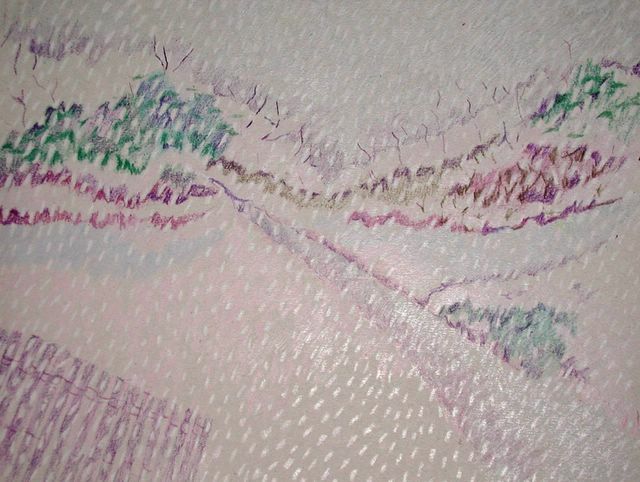 This is another background detail from a photo I took, an "ordinary" view, but not to me. 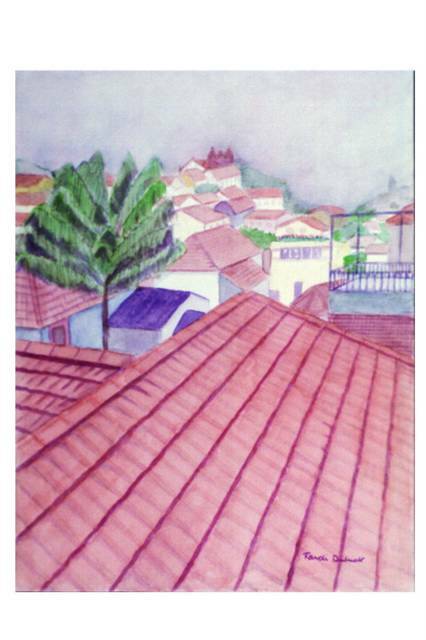 I cropped and colorized this image to emphasize the red tile roofs, the pastel buildings, and the river. Tonight I decided to edit another quick sketch that I transferred from my handheld to my PC last night. 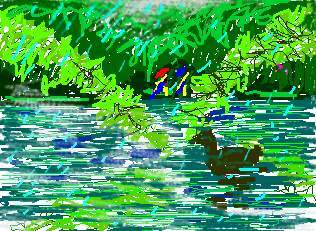 I made this little sketch of a scene at St. Stephen's Green in Dublin in July. For the second time at St. Stephens Green, it rained as soon as we got there, so we sat and watched the ducks and the umbrellas. Toward the end of my trip to Porto last January, I saw the river at night. 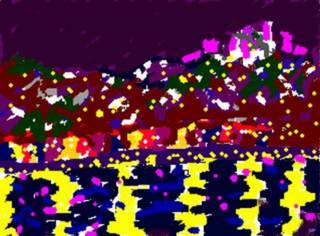 I couldn't take a photograph, so later I sketched it from memory in my Clie handheld. Tonight I transferred it into my computer and edited it with Painter, but not too much because I like the look of the original sketch. Today we went for a walk in the woods. 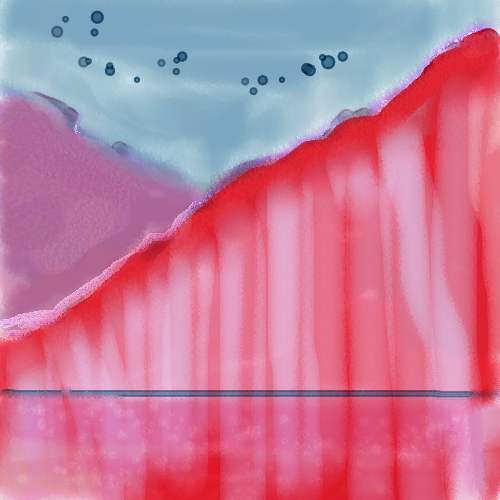 I liked the design the trees made against the hill, so I made this sketch on the computer when I got home. 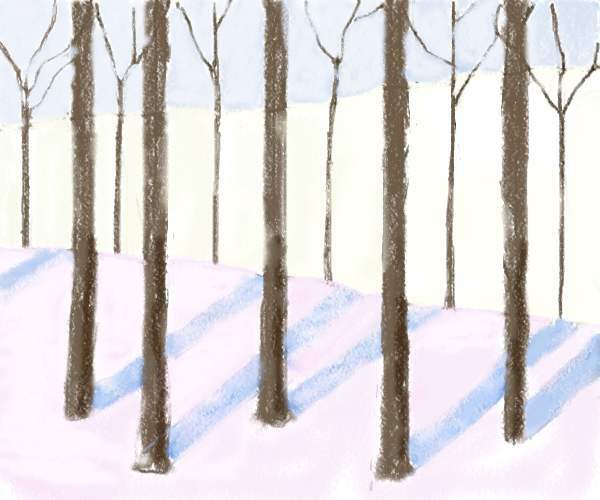 I very secretly love snow, especially the patterns new snow makes on the trees. 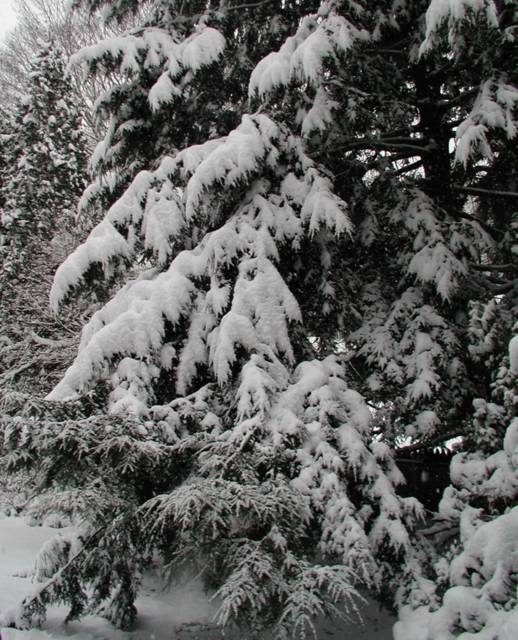 I stepped outside just long enough to take a few photos with my digital camera. 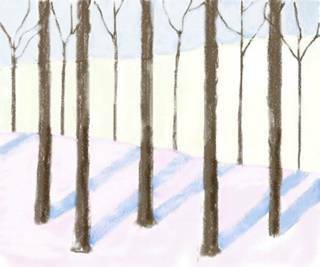 I drew this November scene a few years ago, but I am posting it here now because I have been reading about oil pastel today and because tomorrow Heather will take this to her new apartment. 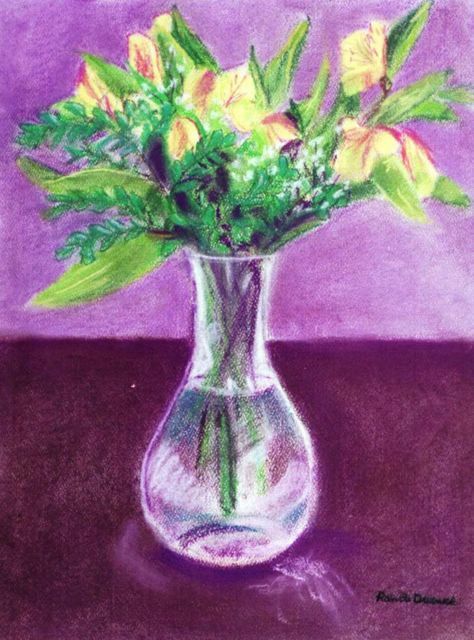 I spent much of January 4th reading about pastels, so I thought I would post one of my own. 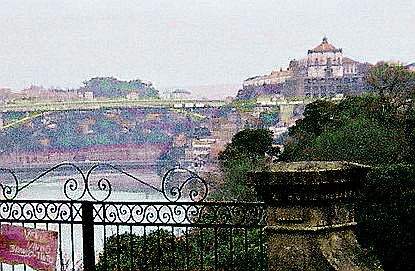 In early January of 2004, I was heading to Portugal. This image began as a background detail in a photo I took in Porto, at Graham's where Mauro took me to see how Port is made. I colorized the image to bring out detail and emphasize the bridge and Douro River in the background. 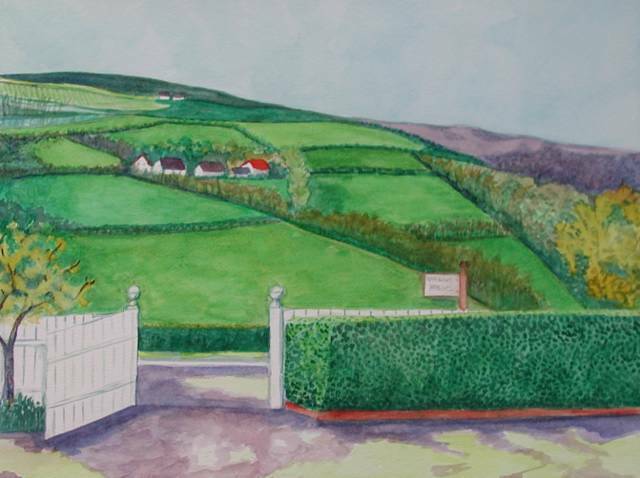 This is a watercolor I did from a photo I took in Northern Ireland last year. We found a restaurant as we were driving on the Antrim Coast, and although the food was great, the view was better. This is a digitally modified image from a photo I took last New Year's Day, on an island in the middle of a lake near Enniskillen. We took a tiny ferry boat to get to the island where we had lunch in a pub with Justin and the day was perfect.